Brown Finish - Metal 3 Dimensional Pine Cones with individual metal needles. Features 3 alabaster glass shades. Brown Finish - Metal 3 Dimensional Pine Cones with individual metal needles. Features 3 alabaster glass shades. 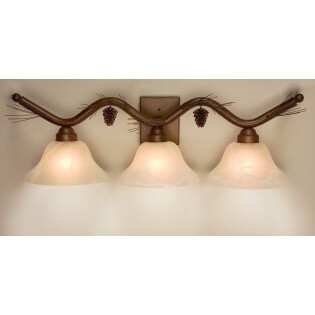 (3) 100 watt “A” style or (3) 60 watt “G” style bulbs with 10” Alabaster Glass Shades. Measures 30” overall length x 10” high.